Wanted / Anyone got some spare Lagoona fins? They're for my Lagoonafire custom. She's missing her leg fins so I just need any LG fins that fit the old leg holes. Unfortunately they didn't all fit on one shelf so Vina gets her own spot below. I'm really excited to get my hands on the SDCC exclusive. Now they just need to make a second wave with Scotty, McCoy, and Sulu for the next Star Trek anniversary. 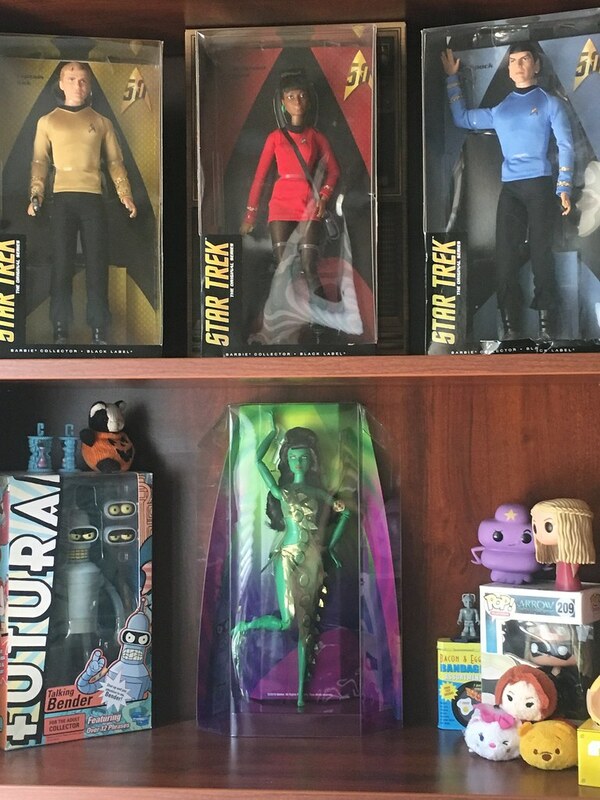 Might take things into my own hands and customize a Kirk to become Bones, but we'll see.... For now, I'm just going to enjoy having a completed collection. Customs / Catwater Customs: Update! 7/10 Lagoona! Hey there! 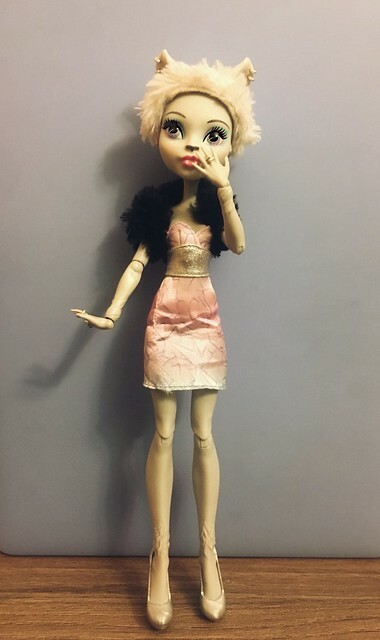 So it's been a WHILE since I last customized a doll... Long story short I was under a lot of stress from school so I took a bit of a break and put most of my dollies in storage. Well they're coming back out! I don't have a ton of updates, since I'm very slowly getting back into things, and I won't be reopening my shop until I get all my inventory back out of storage, but I figured I'd put up a couple customs I've been working on lately. This first gal was a favor for writtenhuman since she got a wonky Lala and I (badly) needed the practice (Seriously I had to start over like 5 times on this ghoul). These next two are Fashionistas that have been rebodied and customized. They were from nearly a year ago but I realized I never put pics up of them. So here's Marina (L) and Violet (R)! 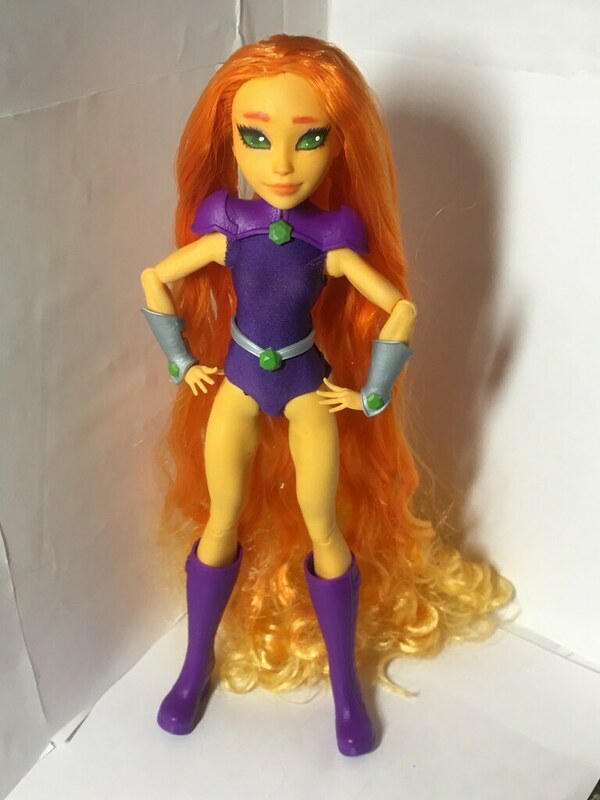 Starfire has long since been my favorite teen titan, ever since I was little and watching the cartoon on TV. 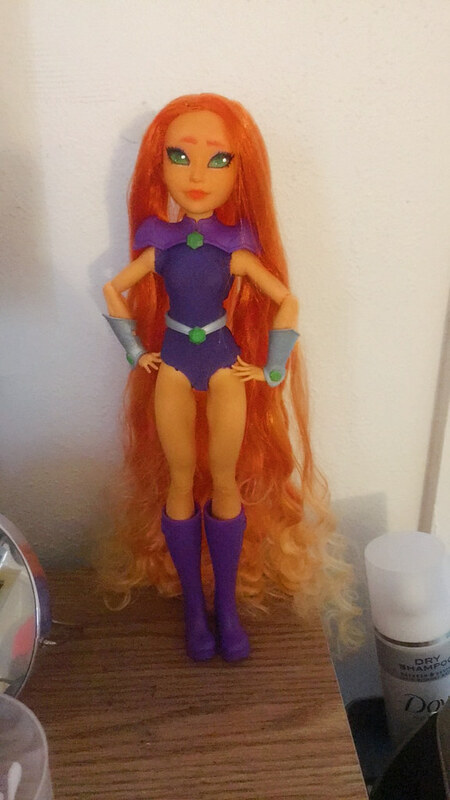 I decided to customize my Starfire doll into my version, combining her comic, TV show, and webisode appearances to make her fit my idea of what she should look like! Her hair was a hand dyed gradient and is even more impressive in person! Her eyebrows are wonky as all heck right now, but it was tiring to get her to this point, so I'll save fixing them for later. She has all her DCSHG accessories, plus a leotard I made out of some scrap spandex. She was wearing the purple MTM outfit earlier, but I like this look better on her. I'm going to be completing my Teen Titans set; customizing Raven or Robin next, but I still need to get the base doll, etc. Hope you like her, and if you have any tips for completing the team, let me know! Sorry for the crappy iphone pics. I'll be uploading nicer ones soon! Customs / Bonita Femur Color Match Question--Bodyswap Suggestions? So my little sister recently has gotten into raising butterflies and moths. Her favorite is the Rosy Maple Moth--which happens to look a lot like Bonita Femur! I wanted to make her a custom of one using Bonita as a base, but I'm not crazy about her hybrid body--the skeleton parts don't quite fit the theme. I was wondering if her head is a color match for any of the other pink ghouls out there. Anyone have comparison pics they'd be willing to share with me? I think she might be a match for Kjersti but I've never seen her in person so I can't really tell lmao. 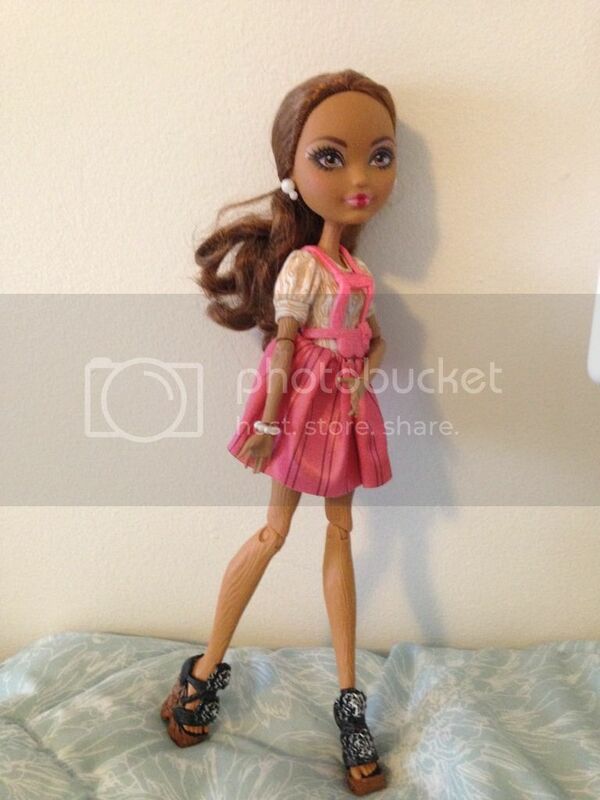 Wanted / Looking for Reboot Rochelle Replacement Arms/Hands!!! Hi there! I'm looking for Rochelle Goyle lower arms/hands from the newer, thicker bodies. 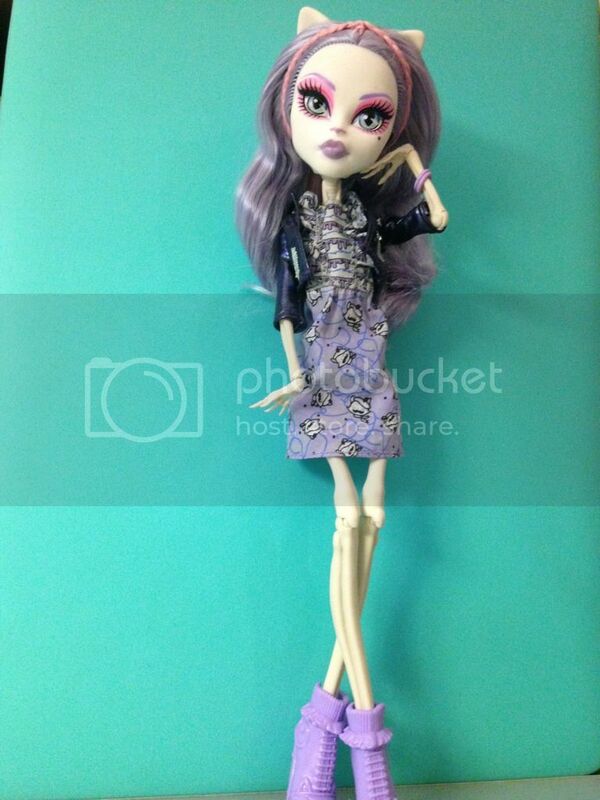 Unfortunately the arms from old and reboot monster high dolls are not compatible. Can anyone help me out? The Mattel parts store only has the preboot versions for purchase. Off Topic / Hi again! Wow!!!! It's been a while since I've posted on here. 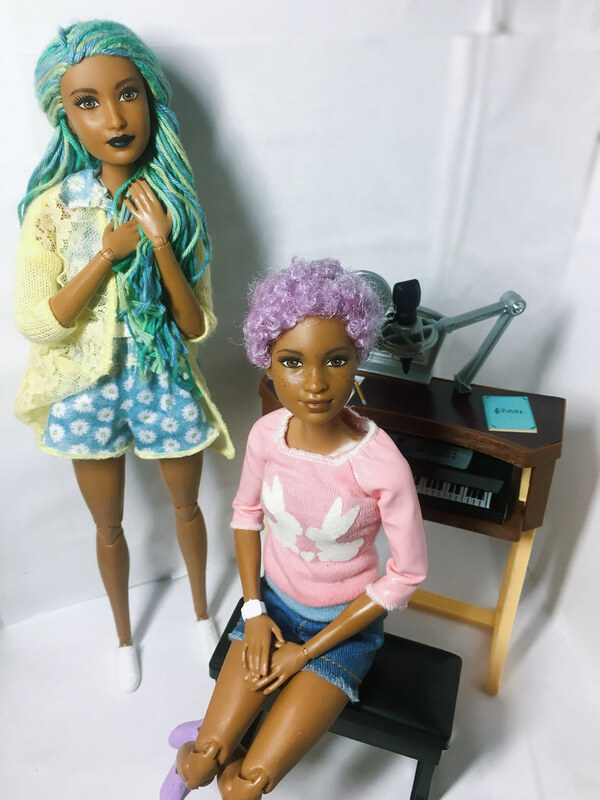 I've finally gotten through the worst (hopefully) of my most recent mental health episode and realized I hadn't picked up my dolls in months let alone tried customizing. Thought I'd post here to check in. How is everyone? It's been a while! Customs / Question About Bleaching? So I want to lighten a doll's skin tone. Before anyone gets mad at me, it's because I'm creating a custom character with vitiligo, so I'm only trying to lighten a few small spots on the doll and I'm definitely not trying to offend anyone, lol. I've heard using skin cream with hydrogen peroxide works to get spots out of vinyl and can sometimes lighten the surrounding area but other than that I don't have any ideas... Would a bleach solution work? The only issue is I'm trying to lighten only a very concentrated area, so I can't just submerge the whole doll in bleach. Most of all I want the difference to be very noticeable, so there's a pretty contrast between her two skin tones. Worst case scenario I'll just paint the markings in, but I was kind of hoping to find a more permanent solution. Anyone have ideas or done a custom like this themselves? 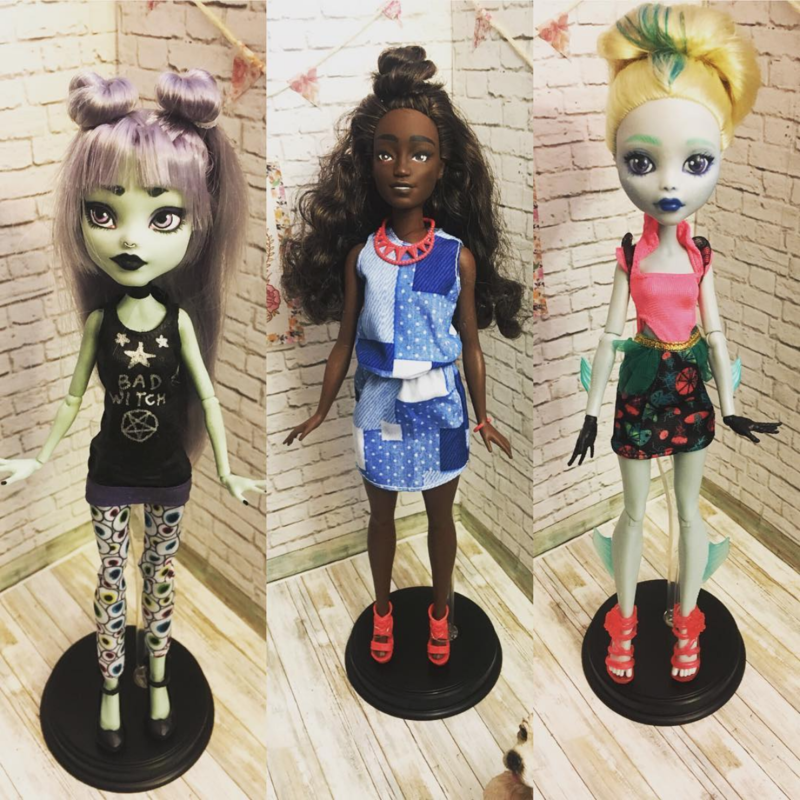 Sales / Catwater Customs: TONS of Custom Dolls for Sale on Etsy! Arena Exclusive Sale! My Etsy Shop is having a sale! 10% off all purchases over $30 with the code ARENAFRIENDS. Examples of some customs up for sale are below the cut! 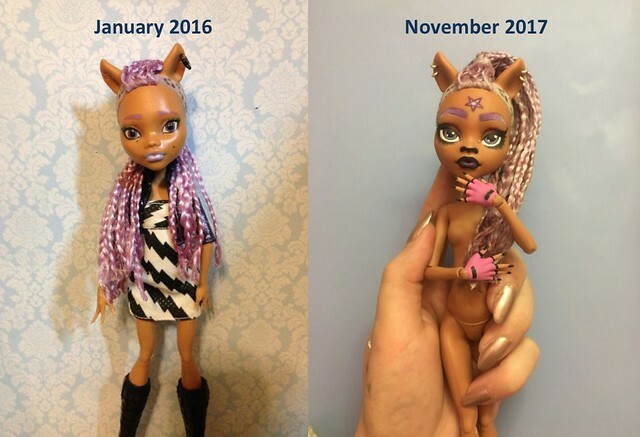 Wanted / Anyone willing to sell a EAH Cupid body (no head)? Looking for an EAH Cupid body (no head please) with hands complete for under $5 shipped... Anyone willing to help me out?? Off Topic / Hunger Games/Mockingjay Fan Thread! I didn't see any that were started on here yet, so I figured I'd make my own fan thread for the Hunger Games series! I haven't gotten to see Mockingjay pt. 2 yet, but I can already tell it's going to break my heart. Anyway, what did you guys think of the series? Which book was your favorite? Personally I thought the books were kind of poorly written, but they were made for a screen adaptation! The films so far have been amazing, and I'm hoping the finale lives up to the hype! Do you collect the dolls? Any other memorabilia? So I got Sugar Coated Cedar a while ago, and while I thought she was adorable, I wanted to give her an outfit that would be better for every day, and not just cooking class, lol! So with a little bit of superglue, some pieces from Spring Unsprung Cedar, and my handy-dandy exacto knife here's what she looks like now! I removed the apron, gave her modded SU Cedar's shoes, and took the shoulder pieces off of SU Cedar's belt. Then used superglue and the suspenders from Sugar Coated Cedar to create a shoulderpiece/belt that I liked much better. And then she's wearing some pearls to complete the look. So I really want the 3pack Luna and Mouscedes, but I have no interest in Elle Eedee or her stock. Does anyone have a pack they want to split? Or does anyone really just want the 3-pack Elle? 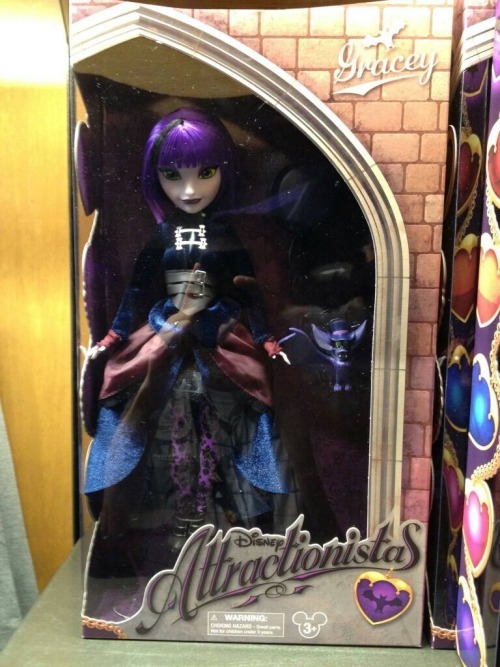 I haven't gone out doll hunting in a while, but I'm pretty sure they're on the shelves at my local TRU/Walmart, so I could pick it up and ship Elle to whoever wants it, but I was kind of hoping someone on here was looking to sell non-shimmery Luna/Mouscedes. Off Topic / Disney's Attractionistas? I read somewhere they were planning on introducing a character based on the Teacups, and maybe some other rides as well! I was playing around with the new Skelita my dear friend Onaca (our writtenhuman) got me for my birthday and appreciating her perfect faceup. It reminded me that I had a wonk-eyed Scaritage Skelita hiding in one of my drawers and gave me the idea to compare the two... I was digging through the drawers trying to find her, and happened upon Ghoul Chat Catrine, who's very pretty but I just never really connected with. her head had started to yellow, so it no longer matched her body.... Long story short I head swapped Catrine with my wonky Skelita and I think I accidentally made my favorite doll ever!!! I'm in love. 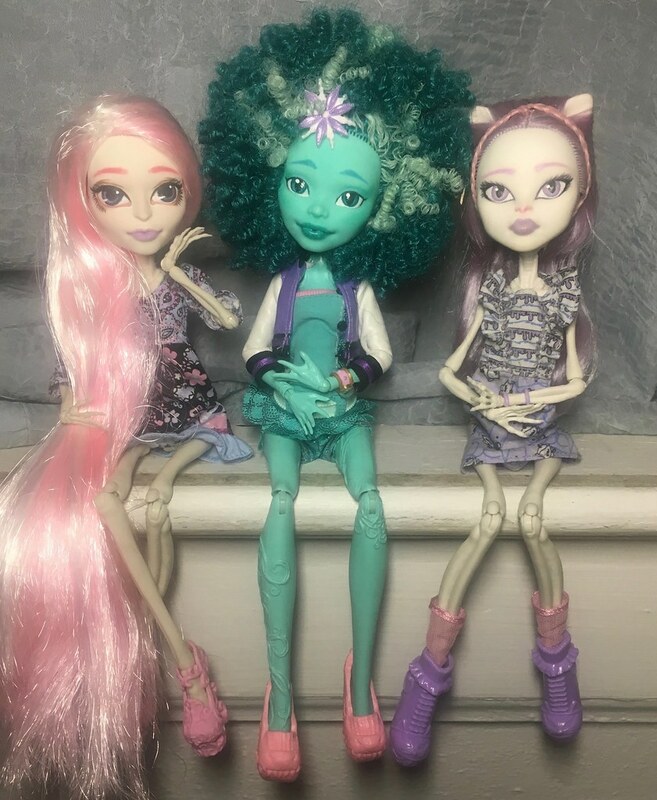 I'm thinking about repainting her so she fits in with my customs and blushing her head to make it an even better match for the skeleton body. But for now she has the place of honor on my desk, where she watches me work.